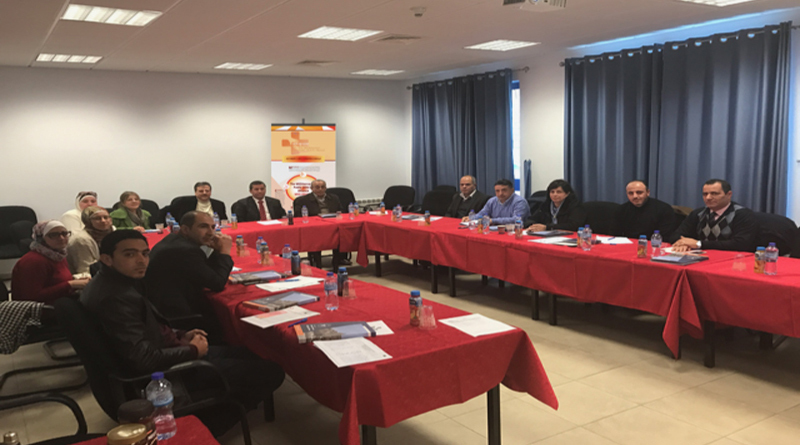 ANNU organized a stakeholder meeting in Faculty of Medicine and Health Sciences-An-Najah University, Nablus, Palestine on February 7th, 2017. Participants included representatives from: Palestinian National Institute of Public Health, Palestinian Medical Relief Society, and the Governmental and Private Hospitals Representatives in Palestine. The meeting was organized with the objective of raising awareness of project activities and expected results among key stakeholders in Palestine, ensure their early involvement and gain their support. The meeting also served as a venue to promote the master’s degree program in public health management and analyze the existing attitudes towards public health education and the perceived needs from the perspective of Palestinian stakeholders. This stakeholder meeting forms part of WP5: dissemination – 5.3 (dialogue with stakeholders) that ultimately aims to ensure full achievement of the project objectives, involvement of the relevant stakeholders and optimum impact of the different activities. This event supports WP2- Implementation of Master Programme in Public Health Management. From the meeting, it is expected that project stakeholders became more informed about the MED-HEALTH project, voiced their feedback and identified opportunities and challenges for the project regarding the curriculum and structure of the master’s program. Furthermore, the meeting initiated the integration of efforts among the higher education and public health stakeholders.